Strengths: Varlamov is a prototypical butterfly-style goaltender with excellent reflexes, flexibility, and size. Varlamov has a very good save percentage early into his NHL career and is developing into a long-term no. 1 goaltender. Weaknesses: Injuries and inconsistency had prevented Varlamov from playing a full NHL season until his fourth season. Varlamov’s puckhandling skills are his main weakness. Biography: Semyon Varlamov was born in Samara (then still known as Kuybyshev) – an industrial city on the Volga. After moving to Yaroslavl, a city further up the Volga, Varlamov developed into the best goalie prospect in his age group with the Lokomotiv hockey organization. 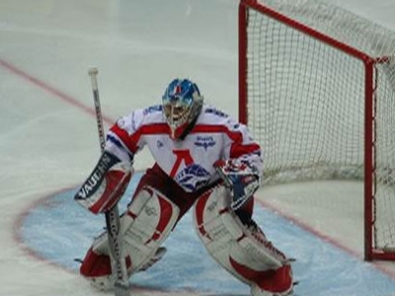 Playing his way through the farm league, Varlamov debuted in the Superleague at the age of 18 and quickly became Lokomotiv’s number one goaltender. In 2007, Varlamov was Russia’s goaltender at the World Junior Championship and helped the team to a silver medal finish. Even before then, he was already drafted by the Washington Capitals and had good NHL potential. After two successful seasons in the Superleague, Semyon came to North America to play for Washington’s farm club. Throughout the regular season of 2008-09, he was called up to the big club a few times and proved to be effective, winning 4 of 6 games. The average play of Capitals starting goalie Jose Theodore prompted the club to entrust Varlamov with the goaltending duties for the playoffs. Varlamov was excellent, registering two shutouts in the first round against the Rangers. 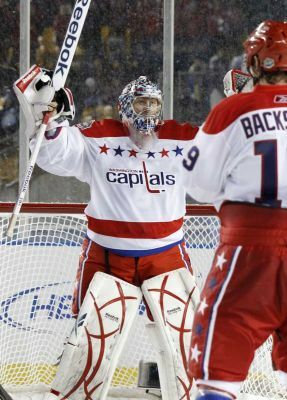 The Capitals were ultimately eliminated by the Penguins in game 7 of the second round, but Varlamov had left his mark as the team’s prospective no. 1 starter. 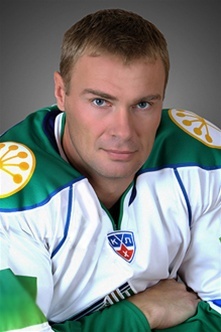 Semyon continued collecting victories in the next season, but an injury two months in forced him to undergo a conditioning stint with the farm club. Varlamov regained his position towards the end of the season, but the Capitals only lasted one playoff round. 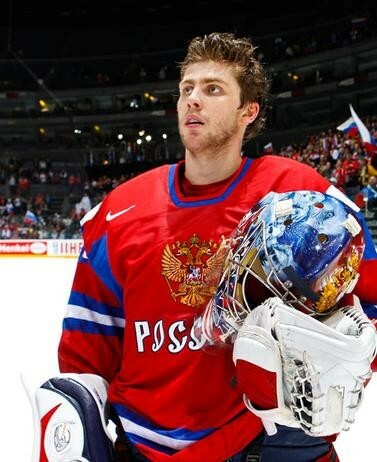 In 2010, Varlamov was named to Russia’s Olympic team, but did not see any ice time. Semyon’s chance to shine for the national team came at the 2010 World Championship, where he went undefeated until Russia’s tight loss to the Czechs in the final. Semyon spent his third NHL season mostly as the backup to fellow young goalie Michal Neuvirth. 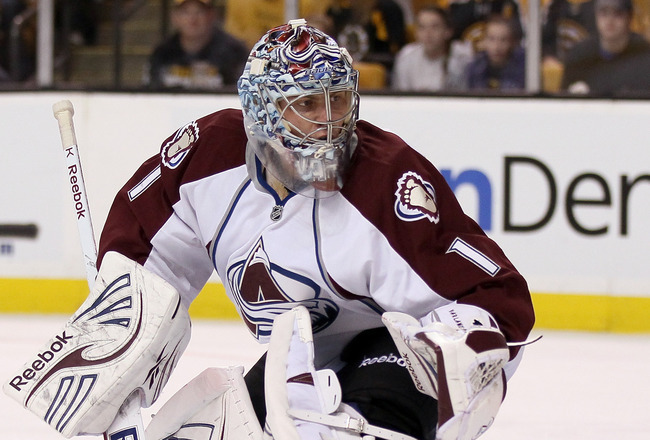 However, Varlamov was selected to start in the 2011 Winter Classic outdoor game against the Penguins. In Washington, Varlamov was one of three Russians, along with Alexander Ovechkin and Alexander Semin, to have a strong fan following. He even starred in a humorous ad with Ovechkin. 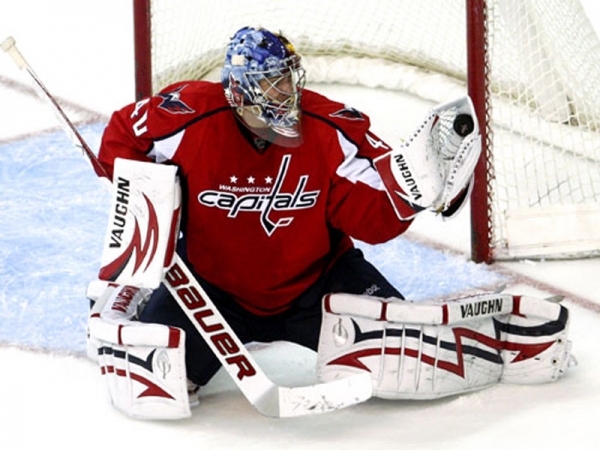 In the 2011 off-season, the Capitals decided to go in a different direction with their goaltending and traded Varlamov to the Colorado Avalanche. In Colorado, Varlamov is starting in a lot more games than he did in Washington, but also has a more fragile and younger team in front of him. In 2012, Varlamov once again was the main goaltender for Russia at the World Championship. This time, Varlamov won all 8 games that he started, including the gold-medal final. For the duration of the 2012-13 NHL lockout, Varlamov returned to play for the club that developed him, Lokomotiv, and put up outstanding numbers. Strengths: Kulemin is an effective defensively-responsible forward with plenty of speed, grit, and a heavy shot. He rarely gives up fighting for the puck, fits in well on any line he is assigned to, and is reliable in any situation in the game. Weaknesses: While Kulemin has proved that he is a 30-goal scorer, he sometimes falls into long dry spells throughout the season. He doesn’t seem to take as many shots on net as he is capable of. Biography: Like his friend and fellow NHL star Evgeni Malkin, Nikolai Kulemin was born and raised in the steelmaking city of Magnitogorsk in the southern Ural Mountains. 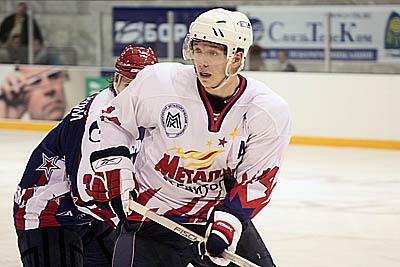 As a teenager, Kulemin developed with the local Metallurg hockey school and made it to the professional league at the age of 17. 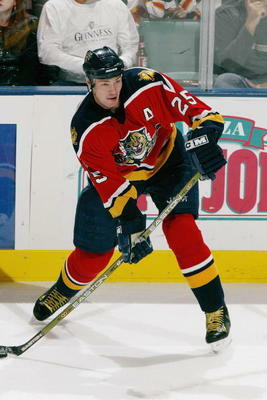 In 2004, Kulemin was a member of Russia’s team that won gold at the under-18 championship. In his third professional season, Kulemin was transferred to Magnitogorsk’s main club, which played in the Russian Superleague. The 2006-07 season was a breakthrough year for Nikolai. 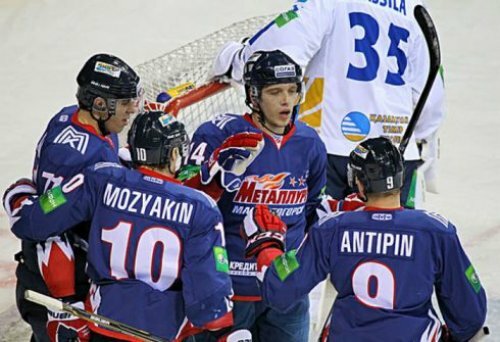 Not only did his Metallurg win the Superleague championship, but he was also named the league MVP after tallying 27 goals in 54 games. After one more productive season in Russia, Kulemin moved on to play in the NHL for the Toronto Maple Leafs, the team that had drafted him in 2006. Nikolai became one of the few players in Leafs history to score in his first NHL game – it was the gamewinning goal against the Detroit Red Wings. 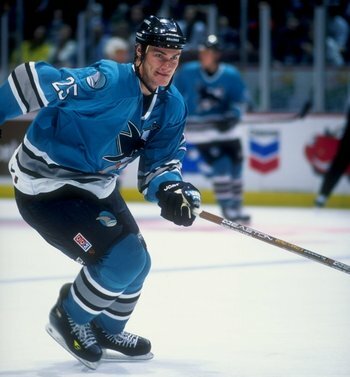 Nikolai’s adjustment to North American hockey and life was eased by the presence of three other Russian speakers on the Maple Leafs – Nikolai Antropov, Alexei Ponikarovsky, and Mikhail Grabovski. Towards the end of the 2009-10 season, Kulemin was promoted to his team’s first line with sniper Phil Kessel and centre Tyler Bozak. In 2010-11, Kulemin emerged as the Leafs’ hardest working player and one of the league’s best two-way forwards. His line with Grabovski and Clarke MacArthur was the team’s most consistent and also arguably the NHL’s most productive second line. Nikolai also broke the 30-goal mark for the first time in his career. In just his fourth NHL season, Nikolai is already the longest-tenured player in Toronto. 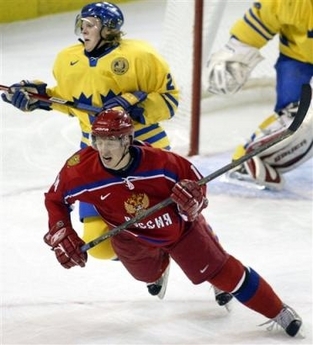 Kulemin has also played for Russia in five world championship tournaments and has won silver and bronze medals, as well as the gold medal in 2012. 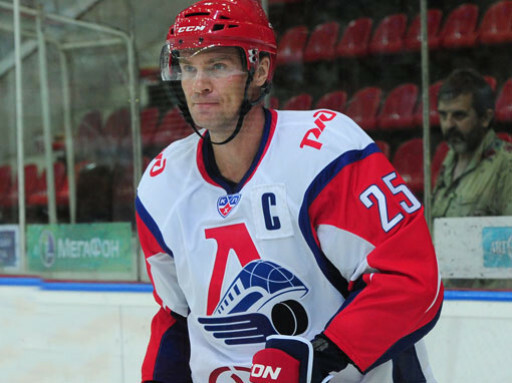 During the 2012-13 NHL lockout, Nikolai returned to his hometown to play for Metallurg. Playing on a line with Evgeni Malkin and Sergei Mozyakin, Kulemin scored at more than a point-per-game rate. He returned rejuvenated to Toronto and helped the Leafs make the playoffs for the first time in eight seasons.